Quick, what’s the first thing that pops to mind when you hear “Miami Marlins”? Odds are your mind’s drifted to “Jeffrey Loria,” “SEC probe,” or “fire sales” — very possibly all of the above. Given the franchise’s history, those associations are largely deserved, no matter what kind of spin you want to put on it all. But none of that, or even Marlins management ordering protesters be tossed from the stadium on Opening Day, tells the full story. When Jose Fernandez mowed down the Mets in his major league debut Sunday, it was a reminder that the Marlins should be known for something much more positive: developing big-time players, and getting them to the big leagues earlier than just about anyone else. Watching Fernandez plow through the Mets’ lineup, you’d never know this was a 20-year-old kid with 11 starts at high Class A ball as his most advanced professional experience. Derided by skeptics as a one-pitch pitcher, Fernandez did rely heavily on his fastball in his first big league start, firing 51 heaters out of 80 pitches thrown. That fastball also averaged nearly 96 mph, topping out at 98. It wasn’t just pure velocity either. Watch the highlights from that game, especially the pitch he throws around 33 seconds; no one’s hitting a 97-mph riding fastball with that kind of movement. But we saw flashes of his other offerings, too, and for one day at least, they were nasty. Twenty-two seconds into the video, we see a strike-three curve, the pitch the Cuban-born Fernandez calls “The Defector,” which completely froze Ike Davis. The scouting reports rate Fernandez’s curve (which can look a little like a slider, or slurve) as a pitch with upside. Then there was this filthy changeup to Lucas Duda; if that’s Fernandez’s third-best pitch, kid’s got a future in this game. The final result Sunday: five innings pitched, one run, three hits, one walk, eight strikeouts. That made Fernandez just the fourth 20-year-old starter in the past 97 years to strike out eight or more batters in his major league debut. For all his obvious talent, we try to keep small sample sizes in perspective round these parts. The more interesting story is what the Marlins saw to convince them that handing an opening-week job to a 20-year-old pitcher made sense, especially in a season that even the biggest optimist would call a clear rebuild. First, a player must prove he can dominate a league, says Marlins scouting director Stan Meek. When Miguel Cabrera made his 2003 debut as a 20-year-old, he’d already hit .365/.429/.609 in 303 plate appearances in Double-A’s Southern League. When Giancarlo Stanton made his own age-20 debut in 2010, he’d hit .313/.442/.729 with a ludicrous 21 homers in 53 games, also in the Southern League. A 21-year-old Josh Beckett got a cup of coffee with the ’01 Marlins after going 14-1 with a 1.54 ERA and 203 strikeouts in 140 innings at High-A and Double-A that year. In Fernandez’s case, you could certainly argue that pitchers face a steeper learning curve than do hitters, that really young pitchers might be more susceptible to injury, and that 11 starts at High-A ball, even when they net 59 strikeouts, no homers, and a 1.96 ERA in 55 innings, don’t constitute a mastery of the minor leagues. But the added ingredient, Meek explained, goes beyond results, or even physical tools. 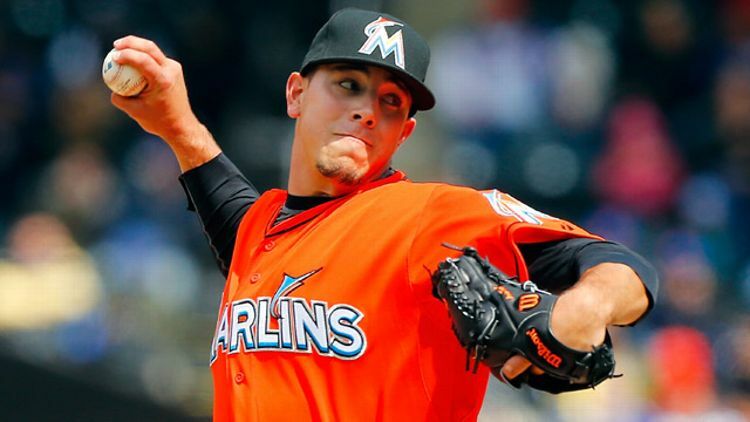 That first dominant start aside, the Marlins know the risks involved in the early promotion. There’s the likelihood that baseball ops president Larry Beinfest, general manager Mike Hill, Meek, and others will get criticized if and when something goes wrong. More tangibly, there’s the money question. The Rays, a lower-revenue team with real playoff aspirations, routinely hold back supremely talented prospects, in part to let them polish their game as much as possible before making the Show, but in large part also to push back the free agency and arbitration clock as much as possible. Yet while Tampa Bay vies for a playoff push without 2012 Minor League Player of the Year Wil Myers (for now), the likely last-place Marlins gave Fernandez a job right from Opening Day. Meek admits such a promotion wasn’t all that financially prudent, given Fernandez could conceivably reach free agency by age 25, before he even reaches his prime. and at least in the minors so far, it has. Going for high-risk, high-reward players, then bringing them to the big leagues early remains an approach that might or might not work out for the Marlins. The team clearly has an eye for premium talent. But it also has a penchant for roster teardowns, so much so that Stanton’s name’s already been mentioned in trade rumors, even though he can’t become a free agent until after the 2016 season. Stanton’s already a star, Fernandez might become one soon, and Yelich might not be far behind. The next step is to keep them all in orange long enough for any of that to matter.